On February 7, I became a permanent resident of the United States of Mexico. Picking up my identity card and putting it in my pocket was a nearly indescribable experience. Twenty years of renewals, accumulated one by one, dropped away all at once, and shedding their psychic weight was delicious. Visiting the National Migratory Institute (INM) is a lot like going into any cop shop anywhere. The staff is uniformed. Armed federal police are on patrol. Sitting at desks, being interrogated, are the hapless supplicants who have the misfortune to be foreign and in need of a favor from the agency. Not that it’s any different for Mexicans who need permission to enter into, and / or stay in, the U.S.A. In fact, in comparison, it’s far harder on Mexicans going north. No matter how polite and friendly they are – and in all fairness, they have always treated me well – a thought flitters and glimmers in the back of my mind: they get to decide whether I stay or get booted out. They are taking measure of me, looking for flaws or contradictions, just like any other cop would do. It is this tension, however self-created, that I can now put behind me. I will, barring some extreme and unforeseen circumstance, never see the inside of this office again. As I walk away, card in hand, I resist the urge to hop, skip, and click my heels together in the air. Twice a year, we go through this confusing and unnecessary period, where time bends back upon itself like a snake swallowing its tail. Daylight Savings Time is upon you – but not us. For reasons probably having to do with national pride, Mexico remained on “standard” time, opting to make the leap at a later date. Starting Sunday (the 9th), California and others in the Pacific time zone were only ONE hour behind us; New York 2 hours ahead. Denver was on the same time as us, and Minneapolis an hour ahead. On the first Sunday in April, Mexico will go on Daylight time, only to repeat the whole confusing process all over again in the fall. Para todo mal, Mezcal (for everything bad, Mezcal). Para todo bien, también (for everything good, also). The blue agave cactus takes as much as ten years to mature. If there is a drought year, then there will be a poor harvest. There have been drought years, and for the last couple of years or more, the supply of pina – the heart nut from which Mezcal is made – has been diminishing. Tequila is also made from blue agave, and the area of Jalisco state in which it traditionally grows has also suffered drought. For the last couple of years, the supply in Jalisco has failed to keep up with demand. The worldwide consumption of Tequila and Mezcal has been increasing year after year. The result has been a bidding war between the two industries – one comprised of small growers and distillers, and the other a well-established agglomeration of large growers and distillers – for Oaxaca’s agave. According to eye-witness reports, there are large trailer trucks from Jalisco waiting, when Oaxaca agave patches come to maturity. According to local newspapers, the price of pina has gone up six times over in the last few months. Tequileros can absorb the cost without raising their prices much. while the Mezcaleros, geared to small independent growing and distilling, cannot. There are stories of distillers, finding themselves squeezed between the swiftly rising price of agave and the slowly rising price of finished Mezcal, having opted to close their distilleries and sell their crop to the carpetbaggers from Jalisco. “The Narco” in western Michoacán used to be the Sinaloa cartel. Weakened by arrests and gang rivalry, they lost most of their territory in Michoacán to a splinter group self-named “The Family”. Later, a sub-set of that group, “The Knights Templar” (KT), generally acknowledged as the most violent of the various factions, gained control after a prolonged and bloody struggle notoriously marked with a grenade tossed into the middle of a crowd in the city of Morelia. KT and the other elements of The Familia (TF) are still at war. Most of the towns belong to KT, and KT are said to have been so abusive that the citizens had to put together a guerilla to chase them out. In fact, we are asked to believe, this group of ordinary citizens, self-declared as a “self-defense force” , burdened by the yoke of obscene repression, managed to overwhelm an organized gang with powerful weapons and chase them out of their headquarters village. It’s hard for me to imagine, especially when I see photos of the “self-defense” forces (DF) sneaking through the jungle to attack KT with .22 rifles and single-load shotguns. How then to explain recent events? This photo holds a cross-section of life at the southeast corner of the Zocalo: the sellers of clothes and accessories; of (no doubt pirated) cd’s; a man with a cart selling sherbets; a waiter steering passersby into a sidewalk cafe; a demonstration by the group Antorcha Campesina. I start from the same place I always do when I think about Mexico’s political or economic or judicial system: corruption. “The System” impinges on every single household, helping some – particularly the rich – and hurting the vast majority. Almost nothing gets done without a bribe or a quid-pro-quo. From the lowest municipal worker to Los Pinos, the official residence of the President, no-one escapes The System. Carlos Salinas de Gortari, who was President when I arrived, is said to have made hundreds of millions of dollars managing the dope trade while he was in office. By “managing” I mean picking and choosing which gang (Cartel really is too refined a term to be used in this context) will control which “plaza” (place, territory). In doing this, and occasionally enforcing “Order” with the Army, he was following a model that had been put in place shortly after the Revolution: “set a thief to catch a thief”, or, better my thief than yours. After the Revolution, a very sophisticated form of Fascism was installed. It was designed for the primary purpose of funneling money and power from those at the bottom to those at the top. Various spheres of power were constructed (military, church, trades and labor, education, tourism, etc.). Unions were started for each of these sectors: only one for each. This assured “labor peace” and low wages, thus generating more profits for the “industrialists”, and for the politicians and government officials who work on their behalf. With a few exceptions, The System is still operating today. My theory is that all this business in Michoacán comes from a sorting-out of which gang gets the support of the resurgent PRI party, and how much they pay for it. So far, it appears to me that the long-standing ties between the Sinaloa folks and Salinas, who is the puppet-master maneuvering the current President, are knitting back together. One faction’s leader has been arrested, charged with murdering two soldiers of the opposing faction. The other faction (so far, neither has been given a name) is said to be riddled with old Sinaloa people. Salinas favored the Sinaloa gang in the past. In Columbia, the “self-defense” forces terrorized the countryside, showing no mercy to the FARC – a revolutionary guerilla that evolved into the largest drugs gang in the country – and were rewarded with control of the dope trade. Could it be probable that this is a repeat of the pattern? This quote is currently making its way through the Web. While I believe it to be mostly true – you can get top notch care in Mexico; and it does cost a fraction of similar procedures in the U.S; and you can buy national health insurance – it leaves out some details, such as that you must be a resident: tourists may not join the national health plan; and that all of the nightmare scenarios about long lines, delayed diagnoses, etc. that have been used to scare us out of one-payer in the U.S. are true down here; that lab tests may be ordered but the necessary reagents may be out of stock; and that some procedures may require travel to Puebla or MexCity. 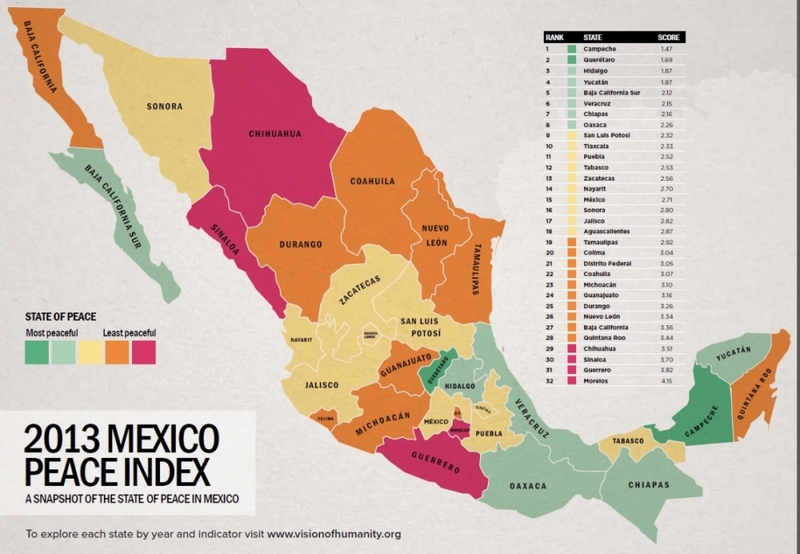 **How does your favorite Mexican state rate on the safety index? Take a look at this map. **Arnulfo Mendoza died in his sleep recently. One of the original students in the Taller (taYER; workshop) of Rufino Tamayo, Arnulfo was a master weaver who produced tapestries as well as rugs and paintings. He and his ex-wife Mary Jane Gagnier founded the gallery La Mano Magica. He was 60 years old.